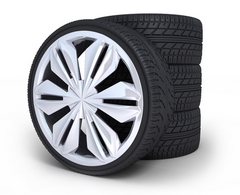 As one of the leading centres for tyres in Berkhamstead & in line with our commitment to our clients, we offer a range of quality tyres to suit every budget. We keep a majority of tyre types, sizes and tyre brands which can be sourced within 24 hours, so if you find yourself with a puncture or needing new tyres due to MOT or last minute emergency don't worry, just give us a call and we can let you know if its in stock or will order for next day delivery. Before replacing any tyre, we will check if it can be repaired. 1) Monitor and adjust the tyre pressure – required tyre pressures vary depending on the load that you are carrying, the road conditions and the distance you intend to drive at a minimum. Your car handbook will have a section detailing the necessary tyre pressures. 2) Visually check your tyres for wear and tear – the location of any damage or wear on a tyre will be an indicator as to whether your tyres are under or over inflated, if the wheel alignment is correct, if the tyre has been kerb damaged or reached the end of its useful life. Our trained technicians can help you to spot the tell-tale signs and give you tyre maintenance tips. Your exhaust is a multi-part system and as such not all of the parts will necessarily need replacing. We can replace full exhaust systems or individual components, whichever satisfies the requirements. The exhaust system is checked every year during your MOT but it is no harm to keep an eye on emmisions and noises coming from the system in case of defects. The exhaust is a key component in the efficient running of your vehicle. We have rapid access to exhaust systems for every type of vehicles, so whether you find yourself in need of a new tailpipe or full exhaust system, we can supply and fit within 24 hours. In most cases, we can examine and replace your exhaust while you wait. If you have any worries regarding the health of your vehicle's exhaust system then call in and see us for a free exhaust check anytime. It won't take us long to have you back to normal again.